The Korean people call it Ieodo and fear it greatly. 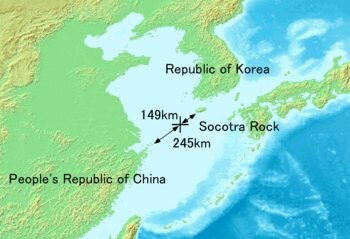 The point is that Socotra Island located in the East China Sea, which is also the subject of a territorial dispute between South Korea and China (before World War II it was also a point of interest of Japan), is actually a submerged rock 4.6 meters (15 ft) below sea level (at low tide). It was seen only during storms and endangered the safety of fishermen. The rock currently serves as the foundation for the Korean Ieodo Ocean Research Station. Ieodo was discovered by the British commercial vessel “Socotra” (which, of course, was named after the Yemeni island) in 1900 and was named in its honor. In 1910 Socotra Rock was surveyed by the British vessel Waterwitch. It is noteworthy that Socotran people believed in witchcraft and even persecuted witches relatively not long ago.